This level has medium difficulty and you need to use good technique to complete this level. 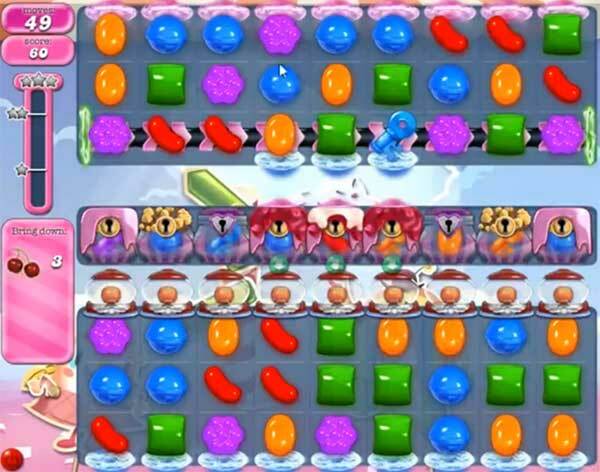 For this level you should try to play more from bottom part of the board to shuffle candies everywhere and make striped candy combo as you get the chance. Try to combine striped candy with colorbomb or wrapped candy to break the keys. After play near to ingredients to take them to the bottom fast. No matter how many times I hit them, the three keys in the middle never break. I have exploded color bombs against striped candies a number of times and I see them hit the keys but nothing happens. Is this level beatable? I’m about to quit playing because of this. I’m ready to quit candy crush because of 879. No matter what I try I can’t get through this level. Maybe it’s a good thing BC I have spent to much money on this game, If their is away you could skip a level, 879 would be it..
I’m ready to quit candy crush too because of level 879. Not having fun really anymore. And I like many have spent way too much money on this stupid f* game! it MUST BE POSSIBLE, BECAUSE I HAVE 7 FRIENDS THAT ARE IN THE 1200’S NOW! I have eventually managed to unlock the keys but then do not have enough time to bring down the cherries. I have been able to get all the keys but can’t figure out how to get the 3 ingredients to drop. I’ve watched the videos and they drop fine on the videos but not when I play. I play on my iPhone I wonder if it’s different on a computer screen. This level is so difficult. I can’t get the cherries down and I been trying for more than a week. Can someone help me please.? I don’t understanding the stratiic of this level, i only see the perfect candies on the levels i don’t get. So for me, not clear at all and i have to wait till i am fed up to iT, i Will say good luck everyone! I am ready to quit! Just can’t get it after 2 weeks or more. I don’t know where the cherries fall. I don’t understatement this level I don’t know what to do with this, not hing is clear, do I have to end here? I have tried everything in this level and cannot get it. I have watched the cheats and still cannot make it work. Frustrating!!!!??? I hate this level, very boring, I don’t look forward to playing candycrush . One of the worst levels of all. I have experienced al out everything everyone is complaining about. Videos don’t help. Time to leave candy crush. WHY DOES THIS LEVEL HAVE TO BE SO DIFFICULT AND DONT EVEN KNOW HIW THE INGREDIENTS DROP NOR SEE THEM DROP? The only way I know is when they are counted‼️‼️‼️ Frustrated in Florida ? This game is not fun anymore, I am getting so sick of it and I loved it. SMe as everybody else ….over it. Whew….I thought that it was just me! It’s sad to come this far, only to give up…..ijs….. I just finished this level and it just took me a few hours once I looked at the tips. I am a novice but after a lot of tries passed it easily! This level is too difficult. Have been play in for two weeks and cannot come close to winning. Your games are to hard, not fun or relaxing. Thinking of quitting to play. Many of my friends feel the same. I am never a quitter but level 879 will be what ends my candy crush life. Games are supposed to be fun. Yes, there needs to be a challenge but this level is beyond figuring out. It’s been several days now and not getting anywhere. Even the instructions don’t make sense. I refuse to buy my way through but I don’t think I could even figure it out then. I’ve had 2 friends uninstall and I might be the next. Where do I find the tips, plz? I am stuck here for a week. I too have trouble at these difficult levels and hope to get a tip by someone in comments but all I get is more frustration because all I see are your whining and threats to quit the game.. What do you hope to gain? Do you think that anybody cares if you quit? I say put up or shut up! If your thinking King will panic at the thought of losing you that he will make it easier for you? Why would he? Your only going to get stuck on another level and start whining into comments again and again… Grab a damn tissue and get over yourself! Comments r no longer helpful. The next time you read of others threatening to quit ask yourself this question, Do you really care? Thanks to those of you who have shared tips, strategies or just comments to give encouragement to those of us who feel it’s too difficult. Sometimes the slightest remark can mean so much, it’s refreshing to find there’s Hope rather than hopeless esp when you repeatedly find so many are quitting. Sometimes it feels like I’ve entered a Crying Forum. I’m ready to give up on level 879. I like a challenge but this one seem impossible. Leaving can’t crush for another game not with this much time in one game. Try going to candy crush 879 on internet for tips. Level 879. I hit the keys many times with stripes, wraps, color bombs and they still are on the board –just move to different spot. Im done with candy crush. Level 879 is impossible. Tried watching video numerous times and cannot get three in middle. Enjoyed the game up to this point but this is ridiculous. Level 879 impossible to reach !